The start of the New Year, and month, means one thing.....The Stylelogue series is back! If you are new to Stylelogue, it's a monthly series where myself, Cortney (from The Grey Edit) and Elisa (from E for Elisa) style our favorite trend that month, but from three different vantage points! 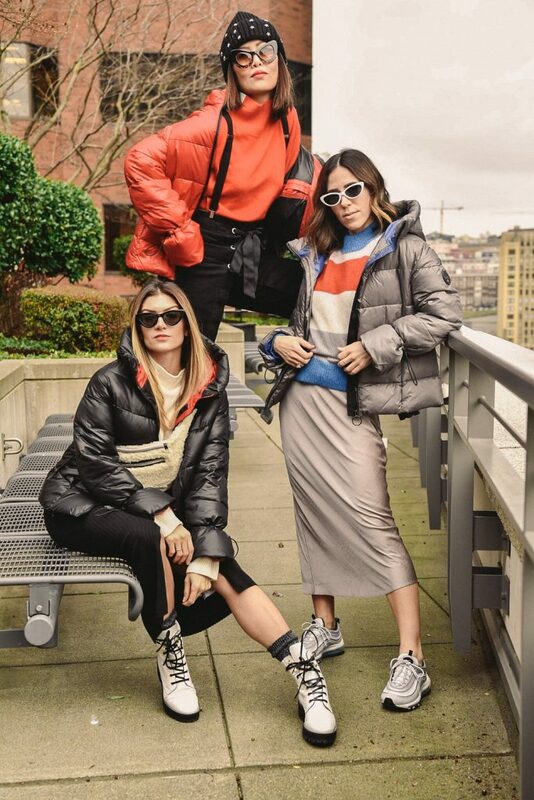 In our third STYLELOGUE edition we are sharing how to style one puffer three ways this winter - puffers are one of the hottest trends this outerwear season! It's that time of the month where your three best friends from Seattle are BACCCCK! That STYLELOGUE is back this month with three killer, and festive, holiday suits from Scotch and Soda! In our second STYLELOGUE edition we are sharing three ways to style unconventional holiday colors in the form of festive suits! Scroll down to read more on how Cortney (The Grey Edit) and Elisa (E for Elisa) styled their looks this month! During my first few months here in Seattle, I have met two amazing bloggers who have become not only inspiring people in my blogging path, but great friends. I am super grateful for the blogging community wherever it may be - there is no denying how hard it is to make friends later in life and if it wasn't for blogging, I wouldn't have met these two! Cortney's blog, The Grey Edit, masters the art of the elevated basics - Elisa's blog, E for Elisa, a sweater designer by trade, has an incredible sense of style that screams editorial. That all said, we created a fashion series that you won't want to miss out on! Welcome to the STYLELOGUE: Chunky Sweater Weather!